JACKSON HEIGHTS — A corridor of the neighborhood's historic district is one of the city's least compliant in keeping itself up to landmarks code, city officials said. More than half of the businesses on 82nd Street, between Roosevelt Avenue and 37th Avenue, have racked up violations with the city's Landmarks Preservation Commission, from having the wrong sized awnings to deteriorating facades, to illegal signage, a spokeswoman said. But a local business improvement district, which plans to use grant money from the city to upgrade stores along 82nd Street, could soon reverse the blitz of the more than 52 open violations currently on record for the block while also helping businesses avoid fines. 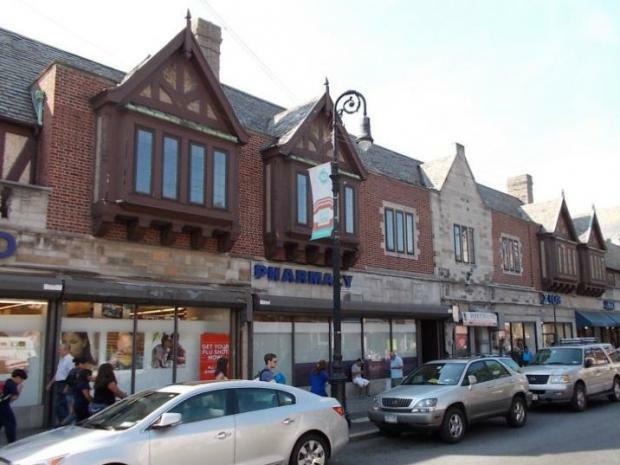 "Immediately what came to our mind was this storefront improvement program, because we do have a number of buildings in our district with landmark preservation violations," said Seth Taylor, executive director of the 82nd Street Partnership. "For us, it was a good opportunity to address these issues." Lens Lab Express owner Brad Polan, 49, said his awning was grandfathered in from before the street was voted in as a landmark in 1993. But he said he has still been hit with complaints from the landmarks commission — which, if uncorrected, could lead to fines of up to $5,000. "They hassle you about the size of the letters, size of this, size of that," Polan said. "They want businesses to coincide with the '20s and '30s." The cost of replacing awnings and signage can be a burden to small businesses, Polan said, and that money could be better spent on the cost of doing business. "I just want to do business," Polan said. "I want to make a couple bucks. I certainly pay a big enough rent here." The Landmarks Preservation Commission keeps records of violations by lot — a section of land that may contain more than one building — not by business, said committee spokeswoman Elisabeth de Bourbon. But she confirmed that every lot in the 82nd Street corridor has received at least one violation apiece. De Bourbon said none of the lots are currently being issued fines, and added that they have been working with Taylor to fix the violations. "We're not working to punish anyone," de Bourbon said. "We're just looking to see the work legalized." Taylor said that the partnership has turned to the Small Business Services BID Challenge Award for help funding improvement for the neighborhoods. The award, which provided grants for local business improvement districts like the 82nd Street Partnership with budgets less than $1 million, asked districts to identify a need in the neighborhood and come up with a plan to address it. Seven districts received a grant from the city, including 82nd Street. Now, the partnership is using the $50,000 grant to reach out to those businesses, help with the paperwork, pay for an architect to design a new storefront and match funds on construction. "Part of the problem is that the rules can be a little complicated, and applying for the necessary permits can be complicated and time consuming," Taylor said. For its initial run, the partnership aims to upgrade some of the more visibly out-of-step shops, including some of the stores on the corner of 82nd Street and Roosevelt Avenue which have a hodgepodge of signage ranging from a wooden plank to vinyl banners. With any luck, Taylor said, the contract with the city will be finalized soon, and they'll be able to kick off the program by early 2013. "Our hope is we can come in and help them out, and get some permanent signage for them up there and improve their business," Taylor said. "We're saying to the businesses, 'We're here to help you.'"